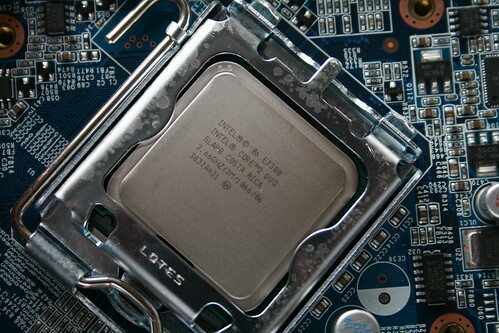 One of the numerous 64-bit-ready processors, the Core 2 Duo E7300. Photo (CC) William Hook. We have spoken with most of the AE plug-in developers and almost all of them are preparing updates that will run on 64-bit After Effects. Most will be available around the same time as After Effects. We’ve been actively working with them to make it as easy as possible to do the updates. We are always looking for ways to improve performance in After Effects and 64-bit significantly raises the bar. It’s also good to remember that plug-ins will also benefit from being 64-bit. Maintaining support for 32-bit plug-ins would likely slow the transition to 64-bit and create constraints to performance improvements. In the history of After Effects, we’ve never forced this kind of transition, and we made this decision very carefully. In the case of 64-bit, it is clear that making this transition quickly brings the most benefits to After Effects customers. Let me fill in some details for you: We looked at the situation from many angles. We understand we’re creating a small amount short term pain, but we feel it’s minimal given the performance benefits we’re seeing. It’s not directly comparable to other 64-bit transitions. For many years After Effects has been proud of our ability to insulate our plug-in developers from platform changes. It has been extra work for us to do this, and it has been worth it to make things easy for them. When it comes to 64-bit, we were faced with the prospect of adding an additional layer of “insulation” and also converting the old layers. It was actually more efficient for us to spend our engineering time helping other developers with their updates rather than converting this old stuff to 64-bit. So that’s what we’re doing. So while it is technically possible, we had to look at the cost/benefits of doing so. And as I mentioned, we also looked at the drag it would create on the 64-bit transition. I can tell you that customers are worrying more about this than plug-in developers. Most are on board. We also know that people want a few other features and we have some awesome stuff in the works! This will be an excellent version of AE! Thanks, Michael. Obviously, we know the team behind the tool is going to be somewhat biased (actually, I would hope so). At the same time, it’s invaluable to get the perspective inside the development process. And this confirms what readers here said, whatever jitters would-be upgraders may have. Even the author of the last post, Sébastien Périer, wrote in to note that he was simply pointing out what was necessary to make the upgrade leap. And that kind of awareness and education is indeed important, whatever you decide best fits your creative work – even if that happens to be not upgrading. Korg monotron: Pocketable, $85 Real-Analog Synth with MS Filter; Hackable?